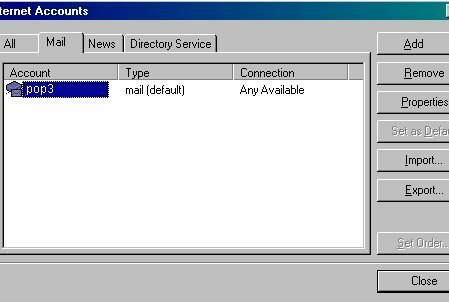 These instructions will walk you through how to change an existing email account in Microsoft Outlook Express to be able to send and receive email when you are using Pacific Online's DSL (or other DSL / Cable providers, as long as you have an active email account hosted by Pacific Online). Step 1 Open Outlook Express. Click the "Tools" pull-down menu near the top, and then click "Accounts...". A new window will open. Step 2 - Click the "Mail" tab. If you have more than one account listed, you'll need to click on the account you wish to update. Then click the "Properties" button and a new window will open. 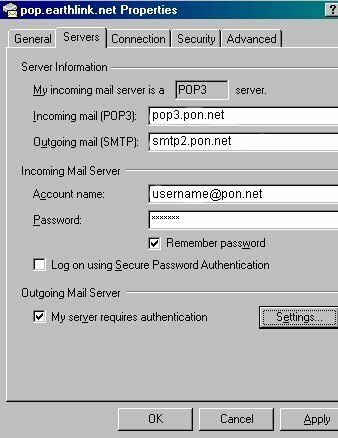 Step 3 - You should already have "pop3.pon.net" (without the quotes) filled in for Incoming mail. 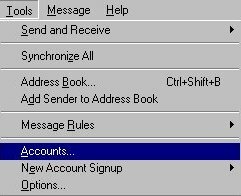 The Outgoing mail (SMTP) needs to be changed to "smtp2.pon.net" (without the quotes). Your own email address and password should already be filled in for the Account name and Password fields. IMPORTANT: You must also click in the check box next to "My server requires authentication". Then click the "Settings" button on the right-side and a new window will open. 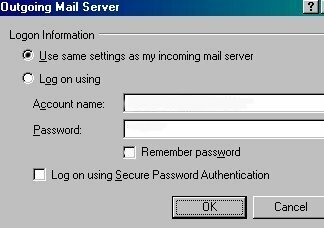 Step 4 - If the circle next to "Use same settings as my incoming mail server" is not already selected, select it now and click OK. Step 5 - Click OK to return to the previous window. Click Apply, then click OK again. Click Close and you're done.